From boldly painted cities to breathtaking natural scenery, there’s a whole lot of colour on our planet. We’ve rounded up some of the most vivid destinations that inspire our imaginations. Check them out below! 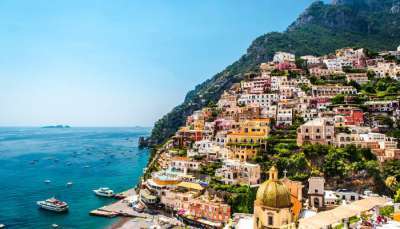 A patchwork of precariously stacked, close-knit buildings spreads out over the steep cliffs that shape the Amalfi Coast. The townhouses of this prestigious part of Italy may have shed some of their pastel stucco over time, but they certainly haven’t lost any of their character in the process! This once white-washed town underwent a drastic transformation in 2011 In a bizarre show of dedication marking the release of the 3D Smurfs film. Every single house was painted bright blue and, although the bold move was intended to be a temporary one, the residents decided to keep it as it is. 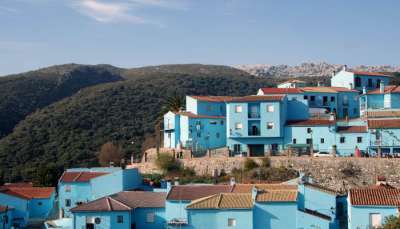 And considering the blue buildings attract about 250 more people per day to Juzcar, we can’t say we blame them. Because what was once an ordinary Andalucian town has now blossomed into a fully-fledged tourist attraction. White houses carved from volcanic rock and cobalt church domes are the fabric of Santorini’s vividly colourful landscape. And juxtaposed with pristine towns are rugged black-sand beaches sheltered by red cliffs. 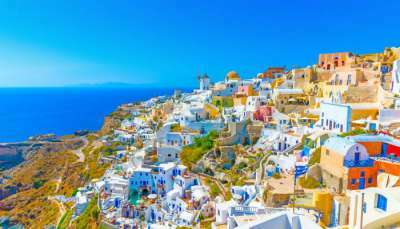 An island dictated by volcanic activity, Santorini is intensely dramatic and instantly recognisable. San Francisco has a lot of colour contributing to its iconic cityscape. First, the pastel-coloured Victorian houses (otherwise known as the Painted Ladies). Next, the brightly coloured hippy shops and psychedelic street art animating the incense-scented Haight and Ashbury intersection. 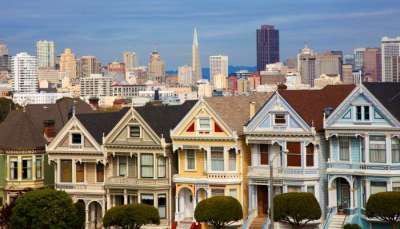 But its highlight is the 1.7-mile-long Golden Gate Bridge that connects the city to the Marin headlands with thousands of tons of bright orange steel. 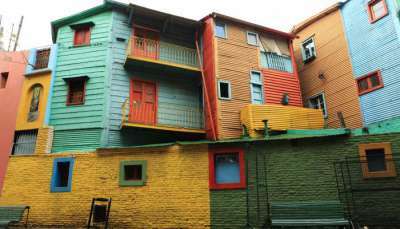 The colourful La Boca neighbourhood is a hotbed for the passionate dance that has put Buenos Aries on the map. In these streets you'll see tango dancers performing to crowds of enthralled tourists in front of a backdrop of brightly coloured buildings. And a few minutes away in San Telmo, tourists gather to admire the striking street art spread over the walls. 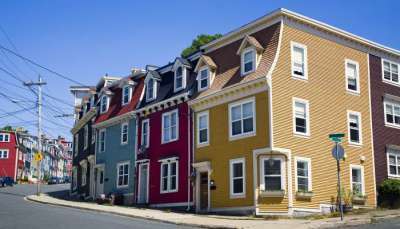 Numerous reasons have been suggested for why the townhouses in St John's have been painted all colours of the spectrum. Perhaps it was to inject some life back into the city after the 1892 fire or to make up for the infamous foggy weather on Canada's Atlantic coast. The largest concentration of these Victorian houses lies in the downtown area aptly nicknamed Jellybean Row. Head there and make up your own mind. A party animal's dream, Sin City is colourful both visually and metaphorically. 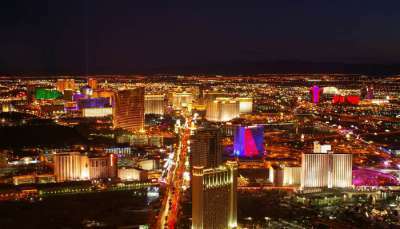 Step out onto the Strip and your senses will be bombarded from all angles. Neon lights beam down from dozens of stories above, music blares out from endless clubs and each resort has its own unique theme, whether it be pirate, Parisian or palatial. 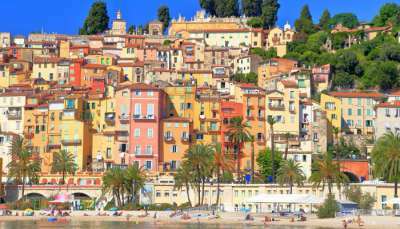 Nicknamed the Pearl of France, Menton is a cheaper alternative to other cities on the French Riviera like Cannes and St. Tropez. Its lovely pastel-coloured buildings are so closely crowded together that they create a collage of salmon pink, coral and peach. It complements the golden sand beaches that lie on the city's edge, making it a popular photogenic spot. 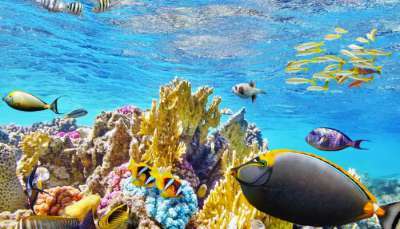 The most extensive reef system on earth, Australia's Great Barrier Reef is composed entirely of living organisms. Around 600 types of coral cover the sea bed and countless tropical fish flit through the water. It's a breathtaking melange of wildlife existing beneath the water's surface. Set against an azure ocean bathed in sunlight, it's no wonder this area holds a place on so many bucket lists. Arguably one of the most colourful gardens in Europe. 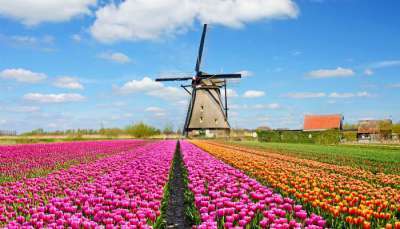 Keukenhof, 45 minutes outside of Amsterdam, transforms into a technicolour wonderland every spring. Timing is important if you want to see the stunning carpet of magenta, violet and butter coloured flowers that seem to roll on endlessly. It's estimated that seven million buds bloom in the area every year, so expect a breathtaking foray on the senses when you visit.